I just finished sewing McCall’s M7730 and I am in love! I had seen a few brocade versions of this jacket on instagram, and then realized I already owned the pattern. I first planned to make it out of the green brocade in the background of my photos….but then I saw this one at Mood. 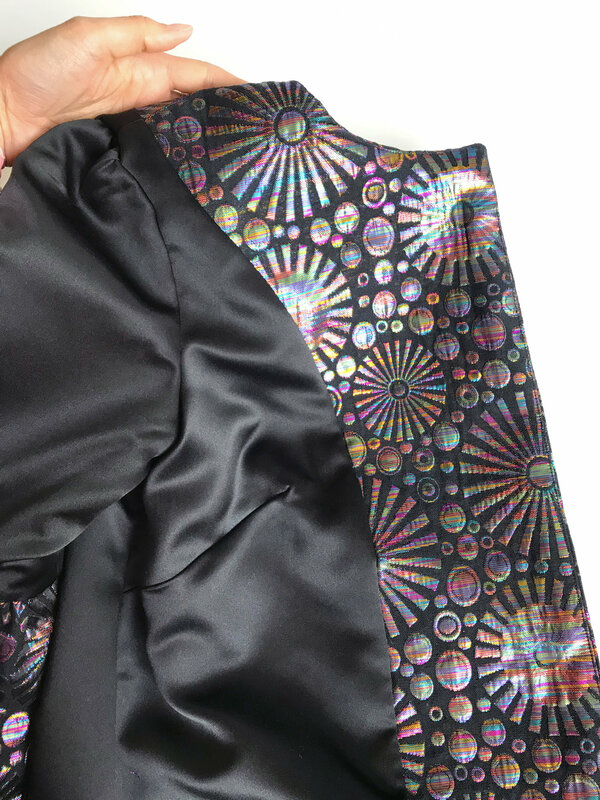 This insane, oil slick, iridescent metallic magic is an Anna Sui fabric. When I first saw it, I only got a swatch. I went back 2 days later for 3 yards. As glittery as this fabric is, I felt it could use something even more extra, so I made a self drafted, hand beaded detachable collar. I’ll write my next post about that collar. If you’re interested in a pattern and/or tutorial for the collar, let me know! I’d be happy to share how I made it. I think this is a fun pattern right out of the envelope, but I wanted it to be a little more substantial, because I was using such fancy fabric. I drafted facings and a front overlap, so I could have snap closures. These alterations are not necessary, but they make a nice finish and will help the lining from drooping. I’ve included a full pattern review below, explaining all my modifications. I chose my usual 12, with C cup option. I made a bunch of changes, but it's similar. Yes, the instructions are clear. The method for machine sewing the back vent is simple. This would be a quick make out of the envelope. I was surprised that the pattern does not call for facings or interfacing anywhere; you might want to add some. Behold! A glorious & glittering metallic brocade that tempted me when the absolute last thing I needed was brocade (I had...5 cuts? at home). It’s from Mood. The back side is block fused with a very lightweight woven, which prevents it from fraying. The lining is heavy poly satin. • Lowered bust dart 1”. • Cut front pieces 12 but graded to 14 at side seams starting below bust dart. • For the back piece, I slash & spread the back piece - I cut horizontally below the armscye and vertically parallel to the grainline at about the middle of the piece, and pivoted it out. This added a wedge, giving me an additional 1” at the hip/bum. I like to do this instead of just adding to the side seams as it gives more volume in the back, not just the side. • Used both in-seam and patch pockets from pattern. • Added 3” length at hem (I am 5’8”). • Drafted facings at neckline and front openings, which I interfaced. I think this jacket benefits from the structure and it looks nice when you wear it open. • Additionally, I added 1" strips of interfacing: at the fashion fabric hem; inside the top edge of patch pockets; seam allowance at in seam pockets; and at the fold in the bell sleeve (essentially sleeve hem). • Extended front pieces 1.5" so they overlap at center front, and added snap closures. • For the lining, I attached neckline and fronts on the machine, underlined and trimmed. I attached the sleeve bell as per pattern. I made the vent, then machine blind hemmed the fashion fabric, and then hand attached the lining hem. • Upper sleeve: This is designed to be a topper, so there isn't a ton of ease in the upper sleeve. If you want to wear this over a sweater, you may wish size up the upper sleeve. I could have gotten the shoulder in without any gathers, but I kinda liked the puff, so I left it. • Lower sleeve: I used the piece for view D, but took out 7" width and added a few inches length. I gathered instead of pleating. Yes, I'd love to make this again, with no front overlap as per pattern. Yes, I recommend the pattern. I'm so pleased with my new jacket - maybe now it's a coat? This is a fun pattern.